LOS ANGELES — It’s been eight games and Los Angeles Kings rookie goaltender Martin Jones has yet to cool off and yet to be phased. Jones won his eighth straight game Saturday afternoon at the Staples Center, stopping three Colorado Avalanche shooters to help the Kings to a 3-2 shootout win and two big points against a top Western Conference foe. The victory ties Jones with former Philadelphia Flyer Bob Froese for the NHL record for consecutive wins to start a career. I don’t know how many times I’ve said this before but he’s given us a chance every night and that’s all you want. The always-stoic Jones is breaking records left and right and continues to take it stride. "I’ve said it before, it’s a good start," Jones said. "But it’s something to build off of and make sure we keep getting better here." A little more than a month ago there was a panic in Los Angeles when starter and Jonathan Quick went down with a groin strain. 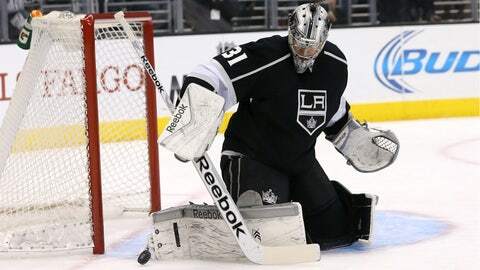 Now it seems the Kings have an excess of high-caliber goalies. Ben Scrivens is also 7-3-4 with a league-leading three shutouts, a .941 save percentage and second in the NHL with a 1.66 goals against average mark. Jones has now recorded two shootouts, with the first being an epic nine-man shootout battl,e and has yet to allow a goal. It’s a small sample size, but he’s already managed to gain the full confidence of his teammates. "I don’t know how many times I’ve said this before but he’s given us a chance every night and that’s all you want," said Anze Kopitar. "He looks really good," said Avs forward P.A. Parenteau. "He’s a big guy, he’s quick and I think he’s got a great future in the NHL for sure." Head coach Darryl Sutter lamented his team’s defense and declined to talk about Martin, saying that one player doesn’t win the entire game. But Jones was arguably the defensive highlight for the Kings, stopping 23 shots and making stops on guys like Matt Duchene look easy. "I thought we deserved to win in regulation today," Jones said. "The way we played, I think we needed one more big save that we didn’t get in regulation there, but the guys did a really good job. (Colorado) came hard on the forecheck, they are tough to break the puck out against, they come really quick; I thought we did a really good job of winning battles." A big momentum swing that netted the Kings two goals early in the game was what started LA in the right direction. And Kopitar scored the only shootout goal to ultimately give the team the win. But try as he might, Jones can’t seem to get out of the spotlight. Quick’s return is as imminent as the decision the Kings organization will soon have to make with three of the hottest goaltenders in the league. For now, Jones sticks with the cliche "one game at a time" motto. Whatever it is that he’s doing, it seems to be working. "For me, I’m just trying to keep working," Jones said. "Just try to keep working and do the things that have made me successful."